This week, we will explore social media and psychology. Technology and social media certainly have advantages. They allow us to stay connected with friends and loved ones living far away. They provide instant communication and information in times of trouble. They can make us smile when we’re feeling down, as evidenced by the plethora of cute baby and puppy videos shared. However, they also have the power to alter the relationships we have, affect our stress level, and give us a little too much information about our friends, such as the endless pictures of what they ate for their last meal. Some topics raised may stimulate discourse about unpleasant subjects but can also alienate people from people if they feel they have less interesting things to contribute. We will examine all the current articles surrounding this new psychological influence. The first two articles come from Science Daily. The first explores social media language analysis, cultural variations, and personality assessment using Facebook, while also tracking community health through Twitter. The use of digital media as a tool for research has drawn together a computer professionals and psychologists to explore the way introverts and extraverts interact, while also using language to identify differences in various cultures. Some interesting results have emerged, such as the fact that those who score higher in neuroticism use language associated with sadness, loneliness, fear, or pain. Additionally, the Twitter community is revealing associations between health and the subject of tweets. Not so surprising, those using language associated with negative emotions such as anger seem to be at greater risk for heart disease, whereas those who express more positive emotions show reduced risk. While this might not surprise psychologists, it can serve as a tool for analysis to clinicians in order to target depression and anxiety in the client. The second article in Science Daily explores the dynamics of people who use social media. A study from Union College found those who use social media are less secure in their relationships, and may be posting in the hope of getting attention. The study found the two main types that use Facebook are those with higher attachment anxiety and those high in extraversion. The authors even label the behavior by attachment anxiety users as “feedback seeking” where they post a comment but may be more sensitive to responses. In fact, this seems to correlate with the amount of posts they make and the feedback they need. The more anxious they are, the more they post. However, extraverts may post for different reasons, such as to engage friendships and are much less sensitive to feedback. They don’t seem to feel hurt by opposing or negative comments. Perhaps psychologists in the future might want to check out a client’s Facebook page, along with asking how they get along with their mother. While the Science Daily article suggests the social media relationships are not “real world” relationships, a PsychCentral article explores the actual relationships in greater depth. The author suggests it may simply be the safer route of relating for those who struggle with security in their relationships, by allowing them to put their “best foot forward” and combating feelings of loneliness. However, these virtual relationships seem to be more superficial, especially when “friending” and “unfriending” occur. Those who are physically isolated from others either by geography or circumstance (such as living in a residential care facility or those who are bedridden) may disagree, in that their ability to communicate may only occur through social media. I know of several non-verbal people with autism who would agree that social media has opened their world up for them. To analyze the quality of those relationships simply by their lack of face-to-face interaction may not be a reasonable reaction. In some cases, such as those with ALS, they may not even be able to laugh, but they can interact using computer technology. Social media makes it possible for them to continue communicating with loved ones where a physical interaction may not even be possible! It does beg the question: what biases influence the current studies with social media and where can we research more to understand how it helps? This month in The Atlantic James Hamblin interviews Mai-Ly Steers, the lead researcher of a social psychology study that uncovers some elements in social media that may contribute to depression, and offers some practical advice in the use of that media. Steers found those who compare their lives with the posts of others may experience decreased self-esteem, especially in contrast to cute baby pictures where the upward comparison of viewing the lives of others as higher than our own is at play. This reminded me of a nasty gram (the term programmers in the computer field call a mean email or post) from a Facebook meme where a group of people criticized a “friend” for posting so many pictures of her children and pets. It received a wide variety of reactions, ranging from total agreement to total disagreement, depending on the people who read it. What seemed to be consistent was the personality characteristic of feeling unable to identify with the individual. Those who did not have children agreed with the nasty gram, while those who did have children or pets felt the people who wrote the nasty gram should find a hobby. It would seem the thread boosted the validity of study. The article also notes an interesting fact that many who use social media forget: the individual who post does not always consider his or her audience when writing the post. While Steers notes that Facebook and Google+ have ways in which to control for that, most people post a status update without considering the impact it has on certain members of their friends list. I was reminded of a comment a longtime friend made when she returned, briefly, to Facebook. She noticed one of our friends was almost militant about her opinion of gay marriage. While my longtime friend was known for being open-minded, it would seem the constant barrage of posts made her feel uncomfortable, even with an open mind. She actually left Facebook for that reason and I cannot blame her. If you haven’t spoken to someone in 30 years, why would you bombard them with comments demanding their agreement with your point of view? Wouldn’t that discourage, rather than encourage, dialogue? More discouraging, the posts might appear to assume the polar position is being taken by others, triggering a push-back response. It is food for thought, and not the type that involves a photo on Instagram. 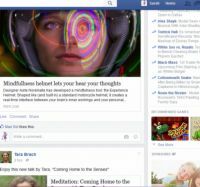 PsychCentral explores the positives of using social media, in that it can provide us with a type of online diary (albeit, a diary that is read by everyone!) Lauren Suval discusses her own experience with MySpace during her teen years, and how it became a type of yearbook to reflect on during her grad school years. Every emotion and memory could be relived, including past loves. The commentary posted by friends is also retained, for better or worse, which has the ability to help the individual relive the experience. This also demands the opposing consideration of whether our social media is secure enough to hold such delicate memories. If an employer receives this type of information, even if it is from 10 years ago, can it be accessed and used against a person? What if it has pictures of underage drinking, or excessive selfie shots? Will that promote the person in a manner that is conducive with the goals of their current situation? It is something that may need to be considered. Ironically, a Pew Research study actually found a relationship between lower stress and the use of Twitter in women, especially when sharing pictures. The increased use of social media and frequency of use did not seem to add to stress in men, and the more women used it, the less stress they felt. This seems to support the previous Pew Research study that showed social media users tended to report higher levels of perceived social support. They suggest this may mitigate stress in the user, and perhaps this is helped by the fact that people, women especially, felt more connected and aware of the life events of others in their lives. (Maslow’s hierarchy of needs proves correct in the virtual world!) It is interesting to examine this from a stress level response, as it supports the need for belonging. For women, this is particularly noteable. When a person receives this stressful information about others, whether close friends or just acquaintance, this did not translate to greater stress in the user. This is a curious finding that Pew Research plans to investigate further. Some social media programs are attempting to open a wider berth for people to interact, including a broader option of interacting with people but New York Magazine investigated the way in which Twitter has made it possible to receive direct messages, even from people who are not designated as “friends.” This creates the potential for abuse when it requires a user to opt out of the program change, opening them up to communication from strangers, even when they have never chosen to follow them. However, the Science of Us has discovered Twitter made this option only possible if the user opted into the program, allowing better control over what communication occurs. The author makes the interesting observation that human behavior prefers the “default position” where the typical person prefers to take the recommended options offered by a program, rather than selectively changing them. When I trained doctor’s offices for WebMD software, we called this the fear of blowing up the program by pressing the incorrect “any” key. The common inclination was to not make a choice that varied from the norm. Unfortunately, pressing “any” key requires a choice, thereby causing the user anxiety. Apparently, Twitter understands this process in human behavior and chose to eliminate the problem. It makes it easier to tweet without being declared a twit by someone who does not have the right to message you. Of course, this does not eliminate a number of other issues referenced in the article, but it is a start in the right direction towards security.